We all know that India is quite a renowned holiday destination among tourists as well as honeymooners from across the globe. It is not only the northern part of India, but the entire Southern India that tickles the fancy of tourists through fascinating places such as Kerala. Yes, newly weds who are fond of South India do make it a point to have their honeymoon in Kerala. Kerela is replete with backwaters, waterfalls, greenery, highly appealing climate and natural beauty that can’t be ignored and this compels honeymooners to plan for Honeymoon in South India. The various attractions of Kerala including beautiful beaches, numerous coconut and palm trees, national parks, temples, ancient monuments, etc. make Honeymoon Tour Packages in Kerala all the more alluring. Those who have a penchant for beach honeymoon tours would be more than happy to have their together times in the honeymoon destination Kerala. Among the significant tourist attractions of Kerala, you have Munnar whose charm gets enhanced due to the existence of Nallathanni, Muthirappuzha and Kundaly rivers as well as tea gardens. The place is also home to mind blowing tea gardens. After going to Munnar during your Honeymoon in Kerala, you both must make it a point to visit the Eravikulam National Park lying 15 Km away from Munnar and to the breathtaking Anamudi Peak, lying 13 Km from Munnar. In Kerala, there is an astounding place called Kollam, also referred as the land of cashews. Coming to this place during your Kerala honeymoon tours, you both be taken aback by the sight of Ashtamudi Lake, would love to enjoy rock climbing, mountain biking and would be more than thrilled to have your honeymoon in houseboat that takes you through refreshing backwaters of Kerala. Places like Cochin, Thekkady, etc. 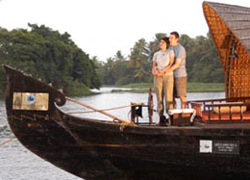 are also an important part of your Kerala honeymoon packages. Wayanad is another place that you would discover to your amazement as you explore Kerala . The charm of this place is enriched by Kabini River, houseboat honeymoon, as well as various other spots that are worth visiting. They include the Edakkal Caves, Pookode Lake, Muthanga Wildlife Sanctuary, Meenmutty Falls, etc. In Addition to this, there exists Kumarakom, which is marked with the extremely calm Vembanand Lake. Kumarakom is an indispensible place that is well included in your Kerala holiday packages for honeymoon. Apart from the abundance of attractions in Kumarakom, there is an important spot for wildlife lovers. Yes, we are talking about the Kumarakom Bird Sanctuary that you both must visit. Your honeymoon in india would remain incomplete if you don’t explore the place called Agasthyakoodam. The Varkala Beach is quite popular among the honeymooners coming to this place. Adventure and religious freaks would be more than elated to visit the place called Vagamon in Kerala. The place has Kurishumala Church that is much frequented by Nazrani Catholics. Thrissur is a place in Kerala that very well delineates the sheer culture of Kerala. Here, you get to explore different temples and academies such as Kerala Sahitya Academy as well as Kerala Sangeetha Nadaka Academy, etc. So, do visit Kerala and bask in everlasting memories of your honeymoon in Kerala. On arrival at Cochin Airport you will be welcomed our representative and transferred to a hotel. Relax and refresh at the hotel. In the afternoon leave for a tour to Cochin, the Queen of Arabian Sea. Places to visit: Bolghatty, Gunda and Willington Islands, Parishath Taamburan Museum, Kerala History Museum, Hill Palace Museum, Chinese Fishing Nets, Santacruz Cathedral, Dutch Palace, Jewish Synagogue, St.Francis Church etc. After breakfast drive to Munnar which is 110kms from Cochin. Munnar in the God's Own country is a unique example of non-ending greenery. Check into a hotel and spend the day at leisure. After breakfast proceed for a full day excursion tour to Munnar. Places to visit: Top Station- Top station offers spectacular views of Western Ghats and Kodaikanal. Also visit Mattupety farm, Mattupety dam and lake and then drive to Rajmala to explore the natural beauty of sandalwood trees in Kerala. On your way back to hotel visit Devikualama and Echo Point. After breakfast proceed to Periyar/Thekkady. On arrival at Periyar, check into a hotel. Periyar is a quaint village famous for the panoramic views of the plains, tumbling waterfalls and coconut groves. In the afternoon proceed for a tour to Periyar Wildlife Sanctuary. Also enjoy the local sightseeing of Thekkaddy and boat ride at Periyar Lake. Overnight at hotel in Periyar. After breakfast leave for a 24hrs Kerala Backwater Cruise. Enjoy your stay in houseboat with all modern facilities similar to hotel. Overnight at Houseboat. In the morning your houseboat will arrive at Allepey. After breakfast check out of the houseboat. Proceed for a local tour to Allepey. In the evening you will be dropped at Cochin Airport to board a flight for your onward destination.